Nepal is the only country with a non-rectangular flag. Instead, Nepal’s flag has two triangular shapes stacked on one another with blue bordering its edges. Records show that the design of this flag is over 200 years old! The capital of Nepal is Kathmandu. There are approximately 29,000,000 people living here (as of 2016). The official language of Nepal is Nepali, but Nepalis speak an approximated 123 indigenous languages as well. 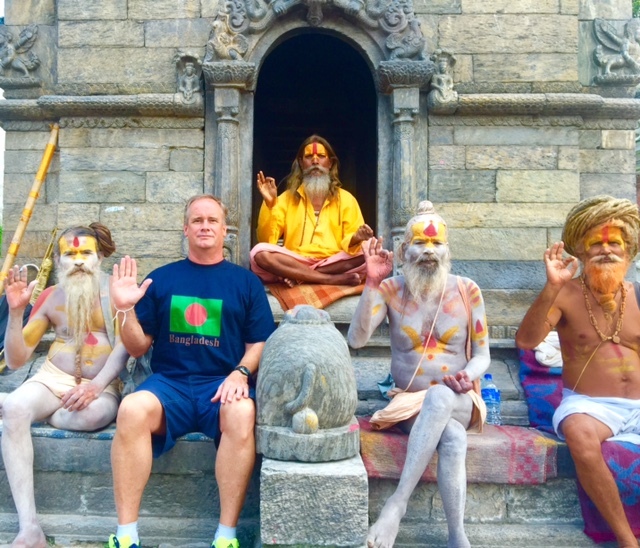 The majority of Nepali practice Hinduism. Major exports of Nepal include clothing, pulses, carpets, textiles, juice, and jute goods. When visiting, adventurers cannot miss out on hiking the Himalayas! The Himalayan Mountains are magnificent, stretching between five countries. Nepal is home to the highest mountain peak on Earth, Mount Everest! Also of interest to the explorer is the historic Pashupatinath Temple, a sacred Hindu temple located near the Bagmati River. When I landed here, I was whisked through security, which was a great sign of things to come. Then from there I went immediately to go see the Boudhanath Stupa, which was very cool with followers of Hindu spinning the prayer wheels. The top of the Stupa was significantly damaged in the April 25th earthquake, which caused significant damage across the country. I took some cool pics with the Sadhus (devout Hindus) who cover themselves in paint. By the banks of the Bagmati River, a family sat beside the burning body of a loved one, whose ashes would be dumped in the river. A ritual for thousands of years, it is a sacred right of passing for one’s ashes to flow into the Bagmati River and then to the Ganges. There I bought a really cool mask of angry Shiva and some other cool ones too. I took a flight to see Mount Everest. But it was covered by clouds. I could see the base camp but the top was not distinctive. Bummer… another day! Went to another Stupa and World Heritage Site but it was 75% damaged by the recent earthquake. I then walked through a small village and took a picture with some school kids whose school was significantly damaged by the earthquake. Walking through Dhaktapur which was a total mess because it’s been completely ruined by the earthquake. I then played a cool game with some of the locals. Later learned the finer skills of creating a cool bowl, followed by making wool at a Tibetan refugee camp. 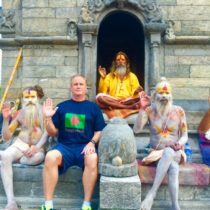 Awesome time in Nepal!